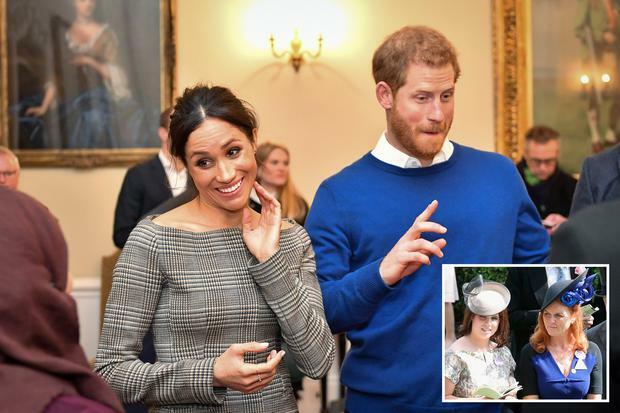 As soon as Meghan Markle and Prince Harry announced their engagement, it was pretty clear from the reaction of the bride-to-be's extended family that the happy couple were going to have quite the fun time doing up their guest list. From Trump to Fergie to the bride's half sister (and apparently now the Spice Girls), Harry and Meghan have their work cut out when it comes to who's in and who's out of their 800-seat St. George's Chapel ceremony on May 19th. With pressure from parents and both financial and emotional factors at play, the wedding guestlist can be a minefield to compile. While you don't HAVE TO invite anyone to your big day (in fact if you're really dedicated to that idea just grab two witnesses on the way in to say 'I do'), you should still put some serious thought into your invites and be diplomatic with how you approach it all. For instance, you don't have to invite your parent's friends, and while money shouldn't buy the power to change that, if you do accept money from them, you might be open to giving over a table or two to them to dish out to their favourite family members, friends, neighbours. And while you may not want kids at your reception, you should know that you risk declines from guests who won't be able to attend without their kids for one reason or another. With that said, here's a list of the people you DON'T have to invite to your big day, as well as a little explanation on how to weigh up whether it's worth it or not! While you wouldn't have it be said that you didn't offer plus ones in the past, nowadays the concept of the isn't so set in stone. The plus one can be offered on a case-by-case basis: if you're inviting several work colleagues, there's no need to give them a plus one as they won't be alone on the day, and the same goes for cousins etc... If you have some guests who will only know one other person, or you know them to be very shy, adding a 'plus guest' to their invite will be a nice gesture. As with everything you find you do there'll be some people who won't be happy with this, but if they don't want to come without their friend/new partner, they don't have to come at all. As mentioned, gone are the days when parents of the just-engaged went around telling everyone in the village that 'Sharon and Paul will be only delighted to see you at the wedding' despite you not having seen sight of those people since you were 11-years-old (and you didn't even like them then). Nowadays after the main list has been done up, many couples will give their parents a couple of invites to ask friends that they themselves may not know as well, but as with all things wedding-related, this isn't a necessity. Have a chat with your other half before discussing the list with your folks and remember whatever you give to one set of parents, you should really give to the other. There's nothing that sparks a wedding guest list debate more than the question of children at weddings. Do you extend the invite to everyone's little ones? At what age do you draw the line? Do you keep it to just the flower girls and page boys? What about toddlers? The take-away from this is you don't have to invite everyone's full family to your nuptials, although many will assume their little ones are automatically invited if they are. If you're not having children at the wedding let it out through word of mouth and whatever your decision is stand firm on it. Weddings costing what they do, you shouldn't feel pressured into keeping a table at dinner for your work colleagues, especially if you're not close. Equally, don't worry too much if you want to invite one or two colleagues and not everybody in the office (or similar) - level-headed people will understand. While some people may not be into them, this is where evening invites works a treat. Ask your work pals to come along to the afters if your wedding isn't a trek away, and if it is, tell them you'll be just going for a few drinks (or similar) before or after, if they fancy toasting your new status. Okay, as etiquette goes, you should probably invite someone who invited you to their wedding, but it's not always the case. If your's is an intimate wedding, you just won't have the space to invite people based on the fact that they invited you to their's (especially if you didn't go). This is often the case with big families and cousins - perhaps one cousin invited everyone in the extended family but you won't be doing the same, in which case, it may seem odd to just choose one or two based on the fact that they ask you to theirs. If you're not close, don't worry too much about it, but try to keep the case the same across the board. If you haven't seen them in five years, no matter how close you were, you don't have to ask a long-lost childhood friend to your wedding. Also remember that your wedding isn't a day for healing rifts or building new relationships. Invite people who you love and who you'd be happy to see as you walk up the aisle - and steer clear of people you'd feel a little anxious about bumping into (it won't be worth it on the morning if they do come). Of course planning such a big life event will remind you of all the friends you loved growing up and if that's the case, try to get in contact and meet them well before the wedding, instead of landing a wedding invite on their door out of the blue.